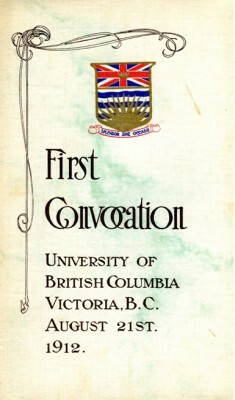 UBC’s first convocation consisted of graduates of any Canadian or British university who had lived in the province for at least two years, plus 25 provincial government appointees. On August 21 UBC marked a significant milestone in its history that few people know about. Exactly 100 years ago on that date, the inaugural meeting of convocation was held. This governing body was responsible for electing the university chancellor and other officials, for awarding degrees to graduating students, and for considering all questions affecting the well-being and prosperity of the university. Although in 1912 UBC was still without physical existence – with no campus, faculty, or student body – the provincial government clearly regarded the meeting as a launching ceremony for the university. Proposals to establish a university in British Columbia had been made as early as 1877, a time when the province’s total population was still less than 50,000. In 1890 the legislature passed an act establishing a provincial university, but the political rivalry of the period between Vancouver Island and the mainland led to a dispute over where the new University of British Columbia should be located. The first meeting of the new university’s senate was held the following year in Victoria. It failed to reach quorum when some members from the mainland refused to attend. A second meeting was never held, the original legislation was allowed to lapse, and the proposed university died before it was born. Post-secondary education didn’t come to British Columbia until 1899, when Vancouver College was established. It was jointly operated by Vancouver High School and Montreal’s McGill University, but in 1906 McGill took over entirely and renamed it McGill University College of British Columbia. The college offered only a two-year program in arts and science; students still had to go elsewhere to complete their degrees. There was a perception among some of those involved that because McGill University College was operating satisfactorily there was no urgent need to establish a full university program. In 1908 the legislature finally passed the University Act that established UBC. The four-year delay until the first convocation was convened was due to the ongoing need to determine the site of the university and the government’s preoccupation with planning and financing railroads across the province. There was also a perception among some of those involved that because McGill University College was operating satisfactorily there was no urgent need to establish a full university program. Under the Act, the first convocation was to consist of all graduates of any Canadian or British university who had lived in the province for at least two years, plus 25 provincial government appointees. Later convocations would also include the university’s own graduates. Letters announcing the meeting were sent to university graduates around BC in July 1912, together with ballots for electing the chancellor and 15 members of the University Senate. Then Minister of Education, Henry Esson Young. The meeting was called to order at 10:00am in the auditorium of South Park School in Victoria, with more than 400 of the 739 registered members of convocation in attendance. Also present were Lieutenant-Governor Thomas Paterson, Premier Sir Richard McBride, Minister of Education Henry Esson Young, and other members of the government. 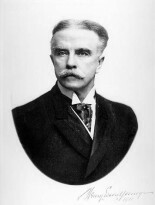 Minister Young was elected to serve as temporary chairman until the ballot results for chancellor were announced. Lieutenant-Governor Paterson spoke briefly and eloquently. 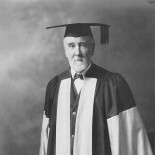 He congratulated the people of British Columbia, and the members of convocation in particular, on the establishment of a university “which,” he felt assured, “would in time equal if not surpass any university in Canada.” Premier McBride also expressed his optimism for the future of UBC, and paid tribute to Minister Young for his untiring efforts to establish the new university. In a president, the government was looking for not merely a scholarly man with administrative ability but a scholarly man with executive ability and a noble character. After Young concluded his address the voting results were announced, and Francis Carter-Cotton was declared winner of the election for chancellor. A well-known public figure, Carter-Cotton had been a member of the provincial legislature for 15 years and had also served as minister of finance. As owner-editor of the Vancouver News-Advertiser newspaper, he had been a consistent supporter of higher education in the province. Perhaps most significantly, he was also chancellor of McGill University College. Before the proceedings drew to a close, there was a vote of condolence to the family of Otis Staples, a member of convocation who had died before he could attend the meeting. Finally, the names of all those present were collected and recorded in the minutes. With that, the inaugural meeting of convocation adjourned on a note of optimism, and a sense of its historical significance. He was described as a tiny sprite with long flowing locks, and she as small and frail-looking. Yet Lionel Haweis and Dorothy Jefferd were both later remembered as the kind of larger-than-life personalities who seemed to naturally find their way to the fledgling university. I’m wondering, is there a reason that this otherwise well-done article about a Canadian university published in a Canadian source uses American spelling (e.g., program) instead of Canadian spelling (e.g., programme)? Thanks for your feedback, Robert! We follow the Canadian Press Stylebook, which in turn defers to the first entry in the Canadian Oxford Dictionary. “Program” is the first entry, with “programme” offered as an alternative spelling. Degrees granted by UBC are recognised around the world. I can attest to this personally having worked in all the countries in the western hemisphere and four countries in Europe. Your article UBC’s Difficult Birth is a good record of a valuable piece of our university’s history. Do you know if there is a record of the names of those registered in the First Convocation or of those who attended the inaugural meeting? Both of my grandfathers, Abram Lighthall and Preston C. Coates, were university graduates (McGill and Ontario School of Practical Science (University of Toronto) respectively), and were residents of BC at the time. I’m curious whether either or both attended the event. According to the records in the UBC Archives, neither of your grandfathers are included in any of the 1912 Convocation lists – although there is a “H.W. Coates” listed as a member but who didn’t attend the meeting. While they were eligible for Convocation, they would have had to register with the Provincial Secretary at the time to be included. They might have missed any published notices or announcements about it. Thanks for reading, and responding!